The Animated Woman: The Grinch's Missing INCH. Is it just me, or has anyone else noticed something wrong with this dude? "You're a mean one, Mister Grinch..."
With a greasy black peel! You're a monster, Mr. Grinch! Yeah! And nobody better Rick Roll this thread or they will feel my animated wrath. Well, now we know just *why* he was a mean one. Whoville's nothing more than a tiny speck. The Whos are even tinier. 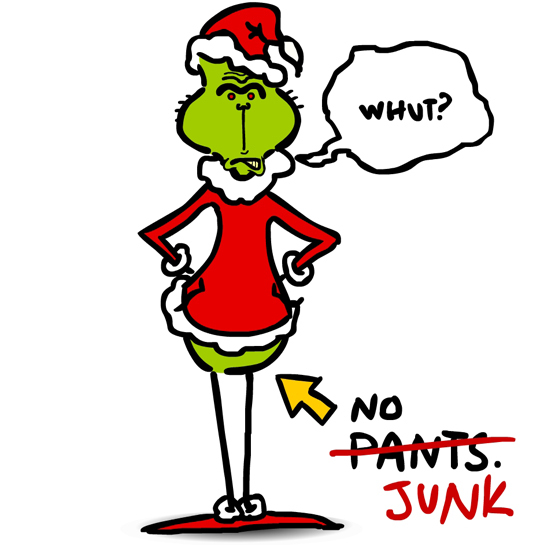 And the Grinch's junk was microscopic even by Who standards. It didn't come up much in the song. I think it was a deleted scene. You are really a sad sack. *gasp! * TechyDad made a naughty rhyme. This means we can all make up words to the song. You really have no deal! Amber crossed the line! Amber crosses the line! LOL! Anonymous - I....I never thought of that. Except it's not MISSUS Grinch, is it??? Smartypants. ...until you stuck it to Santa in one of the most notorious heists in literature. All I know is that his, ahem, "heart" grew three sizes that day. And then we never hear from him again. Perhaps decommercializing Christmas is grinchy Viagra? You're a mean one, Missus Grinch. And you can't fit in your shoes? Anonymous - LOL! Well done! Especially like the last line. OldDogNewTits - Another vote for the female Grinch, huh? I guess it would explain his eyelashes. You're a Monster, Missus Grinch. You've got pimples on your patch! We're playing "Pin the 'tail' on the Grinch"! Ang - Aaron has great powers of observation lol!